It is a sunny December morning in southern California. The air is crisp, but the circle of women standing, waiting prayerfully together is still surrounded by abundant orange, lemon, and lime trees that haven’t yet noticed the chill. 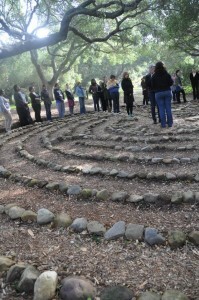 Before us is a large stone labyrinth, one of the many thoughtful installations at Casa San Ysidro, the Catholic retreat center where we have been gathered for the past three days. The light dapples through the trees and onto heads of various heights. It is Sunday, and our time together is drawing to a close. One by one, women step forward to enter the labyrinth, its path ebbing and flowing until finally reaching the center, where a loaf of unbroken bread and a cup of wine sit waiting. We give each other communion, one by one murmuring variations on, “This is the bread of Life, broken for you; the blood of Christ, given for you.” Hands are placed on shoulders; cheeks pressed together; unexpected tears suddenly burst from gently laughing ladies. This is Word and World-style communion: DIY, open to all, occasionally heretical, perfect. It is a moment that I will hold with me over the next several months and beyond; it is about more than just this moment. It is fortification in our work until the next time we are gathered, a ritual affirmation of the community we have built together over these past days. As a planning committee we have decided to cook meals for the retreat , so our communion begins with the chopping and chopping and chopping of veggies, Paul Simon crooning encouragement from a computer speaker. We dart back and forth from room to room, setting up the ritual space here, arranging the buffet line there, stealing bits of time to semi-plan our workshops. I think about the women hurtling toward us at various speeds. I am excited for them to arrive; I start to understand what hospitality means. And then the women do gather: farmers, nurses, social workers, artists. Younger and older; Spanish and English speaking; Christian, Muslim, Jewish, seeking. All excellent at chatting over a meal, all highly proficient in laughing and calling-it-like-it-is. Old friends exclaim with “I never get to see you!” excitement, and new friendships are born over discussions about Audre Lorde, radical parenting, and graphic novels (sometimes all at once). Over the next two-and-a-half days, we get to do the good stuff. It is fuel for when we are back out in the world, doing the good-but-also-hard stuff. Many of us have arrived a bit depleted of that fuel, ready to begin the Advent season by igniting that special kind of flame that comes from being with a group of fantastic, badass women. So on Friday night, we build an altar. It is a Word and World tradition, but the uniqueness of each group means that it never gets old. Each person brings and presents an object that describes a bit about them, and piece by piece, we build a three-dimensional representation of our little community that sits at the center of our circle throughout the weekend. We educate each other, too, and we spend time “in memory of her”–studying and reclaiming the contributions of women who have come before us. On Saturday, Melissa gives a demonstration about natural healing and leads us in thinking back to the kitchens of our grandmothers: what would they recommend for a headache? What gems are stashed away on old recipe cards that we might want to dig out? She makes a healing tea and reminds us that all herbal remedies work best when you stop, rest, and sleep. I scribble the words “stop! rest! sleep!” on my paper, hoping to also imprint them on my brain for future direction. In another session, we open the Bible and look to the story of an older ancestor, Anna the prophet (Luke 2:22-38). 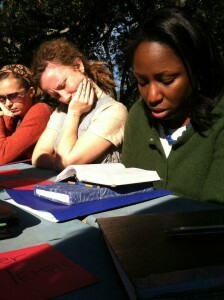 In small groups, we read the story to each other before settling into Quaker-inspired worship sharing out of silence. We ponder what Anna’s life would have been like, how all those hours alone in the temple might have actually felt. We ask: who are the Annas of today? How are we like Anna, or like Simeon, the man who loudly blesses Jesus earlier in the passage? On Sunday morning, we listen and tell stories of our own ancestors, resurrecting them from dusty corners of our brains to make sure they stay a part of our canons, that their wisdom does not get edited out amongst the hustle and bustle of our internal empires. We eat real meals: simple, hearty, beautiful meals. We STOP and sit down for them; we talk to each other rather than to smartphones or to our ever-morphing mental to-do lists (for me, this might have been the most radical part of the weekend!). We exclaim over Elaine’s olive-rosemary bread and Melissa’s southwest egg casserole. On Saturday night, we have a really excellent dance party. It is a weekend of nourishment. Of being the Beloved Community, of reminding ourselves that it is possible. Of preparing for the coming Light by being Light together, opening our hearts toward its possibility. And now, we give that Light to each other to take on the journey. The last few women give and receive, hug, joke, and sigh, and the circle opens out once more. We each have Light within us, and have reminded each other this weekend of its power and beauty. Send us, Spirit, out into the world to do our work joyfully!